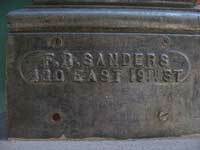 F R. Sanders was Frederick R. Sanders. His iron foundry was located at 424-434 E. 19th St. from approximately 1869 to 1878. This was an industrial area near the East River which was demolished when the Peter Cooper Village / Stuyvesant Town housing project was built in the mid-1940s. Sanders is not well documented in historical sources. He was listed in Trow's New York city directories from 1864 to 1878, then the trail runs out. He appears in naturalization records in 1868 (21 April 1868) when he lived at 92 2nd Ave. His former nationality was English. 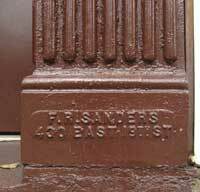 He had a son, Frederick R. Sanders, Jr., who was naturalized 24 Oct. 1872, when he lived at 157 E. 21st St. His former nationality was English also. 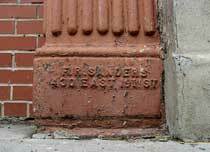 Both Frederick Sanders, Sr. and Jr. were recorded in the 1870 U. S. Census living at this same address (157 E. 21st St.). The father was 45 years old and the son 19. 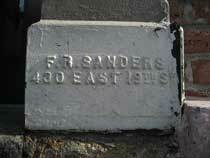 In the 1880 U. S. Census Frederick Sanders, Sr. was 56 years old, born England, and Iron Merchant. 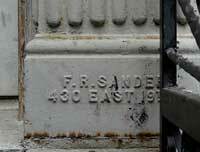 He lived at 58 W. 33rd St. with Jane E. Sanders, his wife, age 51, born New York. 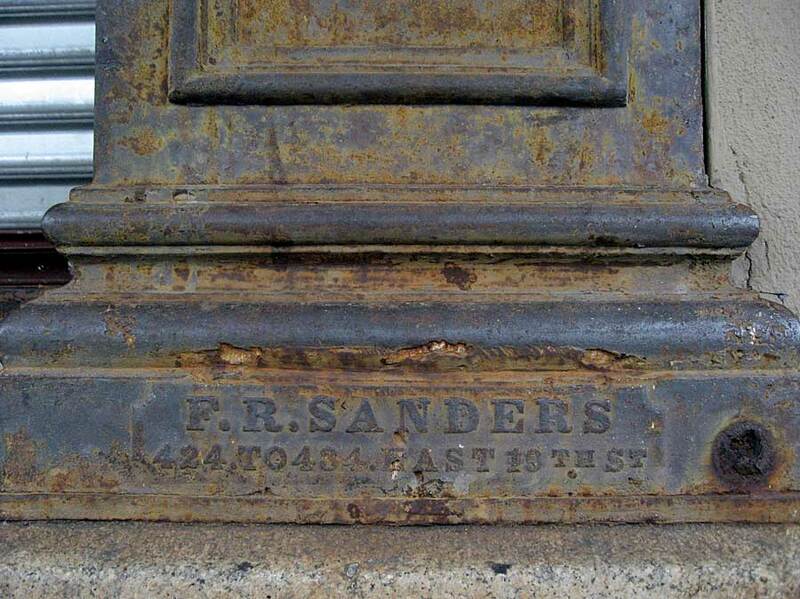 The Sanders boarded with Mary J. Leonard at this address. I found no further information about the life of Frederick R. Sanders, with the exception of this death notice, New York Times, 14 July 1902, p. 7, "Sanders - July 12, 1902, at the Hahnemann Hospital, Jane E. Sanders, 103 West 48th St., widow of Frederick Sanders."